Researchers at the University of Illinois at Chicago and at Argonne National Laboratory have designed a new lithium-air battery that works in a natural-air environment and still functioned after a record-breaking 750 charge/discharge cycles. Their findings are reported in the journal Nature. "Our lithium-air battery design represents a revolution in the battery community," said Amin Salehi-Khojin, assistant professor of mechanical and industrial engineering and co-corresponding author of the paper. "This first demonstration of a true lithium-air battery is an important step toward what we call 'beyond lithium-ion' batteries, but we have more work to do in order to commercialize it." Lithium-air batteries—believed to be able to hold up to five times more energy than the lithium-ion batteries that power our phones, laptops and electric vehicles—have been tantalizing to battery researchers for years. But several obstacles have plagued their development. The batteries would work by combining lithium present in the anode with oxygen from the air to produce lithium peroxide on the cathode during the discharge phase. The lithium peroxide would be broken back down into its lithium and oxygen components during the charge phase. Unfortunately, experimental designs of such lithium-air batteries have been unable to operate in a true natural-air environment due to the oxidation of the lithium anode and production of undesirable byproducts on the cathode that result from lithium ions combining with carbon dioxide and water vapor in the air. These byproducts gum up the cathode, which eventually becomes completely coated and unable to function. 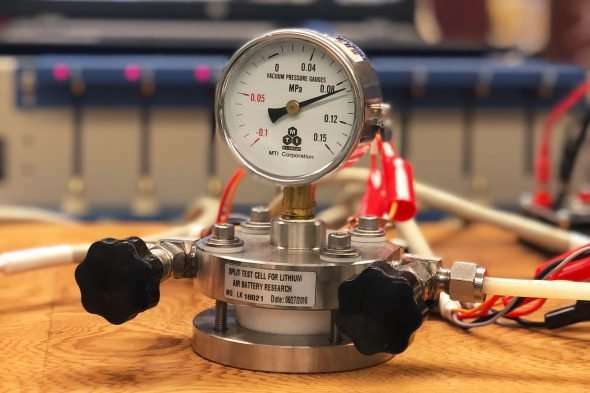 These experimental batteries have relied on tanks of pure oxygen—which limits their practicality and poses serious safety risks due to the flammability of oxygen. "A few others have tried to build lithium-air battery cells, but they failed because of poor cycle life," said Larry Curtiss, co-principal author and Argonne Distinguished Fellow. The UIC-Argonne research team overcame these challenges by using a unique combination of anode, cathode and electrolyte—the three main components of any battery—to prevent anode oxidation and buildup of battery-killing byproducts on the cathode and allow the battery to operate in a natural-air environment. They coated the lithium anode with a thin layer of lithium carbonate that selectively allows lithium ions from the anode to enter the electrolyte while preventing unwanted compounds from reaching the anode. In a lithium-air battery, the cathode is simply where the air enters the battery. In experimental designs of lithium-air batteries, oxygen, together with all the other gases that make up air, enters the electrolyte through a carbon-based spongy lattice structure. Salehi-Khojin and his colleagues coated the lattice structure with a molybdenum disulfate catalyst and used a unique hybrid electrolyte made of ionic liquid and dimethyl sulfoxide, a common component of battery electrolytes, that helped facilitate lithium-oxygen reactions, minimize lithium reactions with other elements in the air and boost efficiency of the battery. "The complete architectural overhaul we performed on this battery by redesigning every part of it, helped us enable the reactions we wanted to occur and prevent or block those that would ultimately cause the battery to go dead," said Salehi-Khojin. The UIC team built, tested, analyzed and characterized the battery cells. The Argonne group, together with colleagues at UIC and California State University, carried out the computational analyses. "These experimental batteries have relied on tanks of pure oxygen—which limits their practicality and poses serious safety risks due to the flammability of oxygen." OK, I know what they're trying to say here, but pure oxygen isn't flammable. Unfortunately the paper is paywalled, so I'm not sure what the state of the battery is in after those 700 cycles. But if it's anything like 80% capacity then that would be quite an achievement.